I have gone barefoot for many years as I prefer my feet to be open to the air. Until a short while ago I wore open sandals when it was impractical to go barefoot. In the summer of 2010 I tried hiking in flip-flops. It wasn't a success, my feet would slip out of them on steep climbs. When crossing or hiking along creeks they would either float off or worse - act like flippers in the water and eventually break. For creeks sandals just didn't work; stones and grit would continually get stuck in them. I reasoned there must be a shoe similar to flip-flops, which did not trap stones, was more securely attached to the foot and less likely to fall off or break. Over the winter I set myself the goal of finding a suitable open shoe for hiking. My research immediately sucked me into the minimalist shoe debate, and I bought a pair of Vibram Five Fingers KSOs. I hike in the Ozarks, where the trails are rough and sharp stone shards abound; on many of the rougher trails the KSO's ground feel proved too acute for me. However, my main problem with the Five Fingers is that they are not an open shoe. I also discovered that the thin soles do not provide ground insulation at lower temperatures. On the plus side they do offer an irresistible invitation to the wearer to run when you hike in them! Back to the Internet, more searching and the eventual discovery of huaraches. From what I could see people were using them for long distance trail running, so hiking and backpacking in them ought to be a breeze. I checked two main websites for ideas: Luna Sandals and Xero Shoes both of which are advocating a style of huarache best described as a minimalist sandal. Even better they are simple to make at home, which meant I was free to experiment. I could also make them a perfect fit for my feet (or flippers as my wife refers to them). Let's just say my feet are short and wide and wouldn't look out of place on Fred Flintstone. I found that the instructions given online for making huaraches needed some adjustment to produce a sole suitable for hiking. In my initial tests I found that when climbing steep slopes and scrabbling over rocks my feet were constantly slipping off of the edge of the footbed. Thinking about it, this made some sense to me, as when used for running the sole is held to the ground as the forefoot strikes. Hiking over rough terrain can place a different set of forces on the sole, which stays in contact with the ground and foot for longer periods of time. 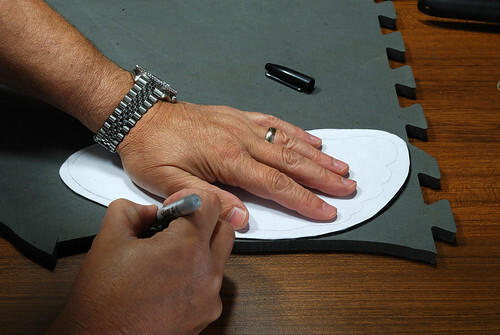 I went through five different sole shapes and sizes before coming up with one that really worked well. The final revision being more of a cosmetic exercise to make them appear smaller. I have found that a sole about an inch longer than my foot gives my feet room to move back and forth and also provides a buffer protecting the heel and toes. A margin of about a quarter inch on the sides leaves enough room for any lateral foot movement and protects my feet from anything poking up into their sides. I also decided that a more substantial sole would be preferable to cope with both the rough terrain found in the Ozarks and the extra load imposed from carrying a backpack. For tying them on, I've been using the 'slip on' method from Invisible Shoe see: http://invisibleshoe.com/tying/ this technique has been working fine for me. I started out using para cord, but it proved too slippery to hold the knot properly, resulting in frequent stops to retie them. I now use normal 54" $2 shoe laces and these are staying tied. I found suitable soling material in a local leather store, there are also various sources online (search for soling rubber sheet and Cobbler supplies). Soling generally comes in 18" x 36" or 15" x 30" sheets. The huaraches I've made have 3/8" (10mm) and 1/2" (13mm) soles made from soling rubber with a fine diamond pattern tread. This has a reasonable grip in most conditions except mud and slime. I have not had any problems with anything penetrating the soles including the quarter inch long razor sharp rock shards I've found embedded in them. Hiking in wet and muddy conditions I initially encountered horrendous problems with my feet slipping around on the footbed rendering climbing steep slopes almost impossible. I fixed this by making a sole with the diamond pattern on both sides. During my first test of these, I found that the footbed grip was excellent and the associated slipping reduced to almost nothing. However, the diamond pattern was far too sharp and abraded the soles of my feet, rubbing raw spots within a few miles. Lightly sanding the footbed removed the sharp points and cured the problem. The revised soles work very well in all trail conditions. The soles also provide good insulation against the cold, allowing me to hike in my huaraches barefoot down to around 32°F. My wife is an avid knitter, and has made a pair of woolen socks with a toe so I can wear my huaraches when it gets even colder. Being wool the socks cope with getting wet and still keep my feet warm. I've worn my huaraches continually as everyday shoes since January 2011 and I've hiked just under 55 miles in the rough and currently wet terrain of the Ozarks in them. They are great. I can walk straight through creeks, puddles and mud while my wife either struggles to find a dry route or changes out of her hiking shoes to keep them dry. I pick up a stone about every mile or so, and a simple shake of the foot gets rid of them with barely a pause. I had concerns about injuries, but they've proved unfounded. So far I've twice caught a stick between the toes - no worse than doing the same when wearing the Vibram five fingers. I have worn my huaraches without problems when bushwhacking off the trail to find campsites, the only time I would think twice about wearing them is when bushwhacking where poison ivy, thorns or snakes are likely. Other good points are that they are very light weight - a great boon when backpacking and they are totally maintainable on the trail. To date the only problem I've had has been with the toe knot coming undone, and that was my own fault for not heat sealing the knot. If the side straps ever pull out, I know I can effect repairs to get me home by simply making new holes with my pocket knife. When needed I can produce a new pair in less than an hour and currently the costs per pair are working out at around $8. This isn't the end though, I have more things I want to try. For slippery conditions I am looking to try other soling patterns to improve their grip, including preformed Vibram soles which can be bought online for $20-$30. I want to try other footbed materials, I'm seeking something thiner but with the same or better grip. I also have the soling materials to make 1/4" (6.3mm) soles, that I've not tried yet. If you are interested in barefoot hiking or backpacking, huaraches have proven to be an excellent minimalist solution for me and I highly recommend them. You may need to experiment a bit to get them just right, but the results will be more than worth the effort. Gary Allman is a fifty-something Brit who somewhat late in life and rather unexpectedly ended up in the American Midwest with his wife Ginger, three step-children and their four cats. After more than thirty years behind a desk in the UK, he can now be found enjoying the magnificent Ozark scenery. He's learning lots of interesting new ways of keeping himself occupied; hiking, backpacking, kayaking and fishing. Gary writes about some of his activities in his hiking, paddling and backpacking blog. His favorite photographs can be seen on his photo-blog Breakfast in America. Gary can be contacted at www.gary.allman.uk.net.